Attention, attention! Another recipe for ingredient of the month! My first thought was to create a pearsauce, a pearallel to applesauce. After all, pears have similar tastes and textures to apples after cooking. They also work favorably with the same spices. However, Rob thought that a pearsauce was too obvious. It was unoriginal. I desired an original, new and exciting recipe, so I searched for another idea. After pearsauce, I thought that I would do a healthy version of a horribly unhealthy recipe. I searched a website called mrfood.com. I found a few recipes on Mr. Food that contained pears. Caramel Pear Cake, Baked Pear Tart and Skillet Pear Ginger Pie were a few examples. All were ridiculously unhealthy and laden with added salt, sugar, fat and cholesterol. However none of them struck me as something that I longed to revitalize and update. Not long after I mysteriously came across Altwiener Apfelstrudel. Translation: Traditional Viennese Apple Strudel. I’m not sure how or why I stumbled across this dessert. It’s likely related to my inability to focus on something for more than 5 minutes at a time without getting sidetracked. I remember looking up holiday recipes…German recipes… German words. Then I remember stumbling across Altwiener Apfelstrudel. I guess I just blacked out from surfing the internet so intensely. After I came across Altwiener Apfelstrudel I was hooked. I knew what to do. 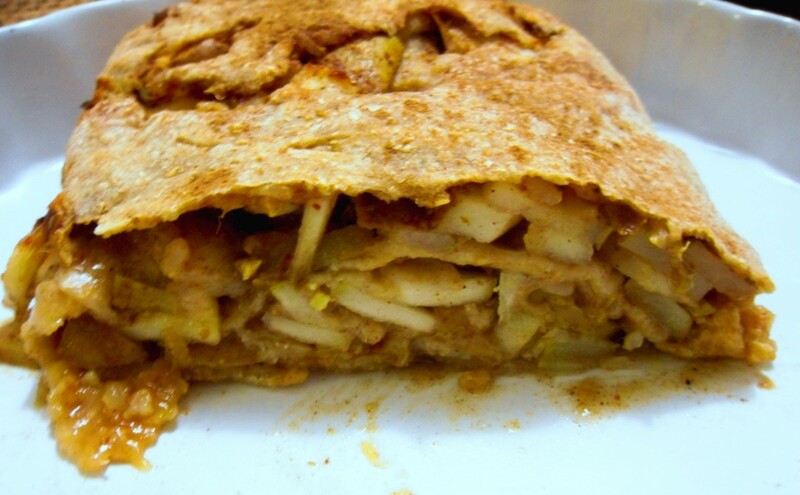 Combine Altwiener Apfelstrudel with my other new obsession: garam masala. I had a basic outline of what my recipe for ingredient of the month was: a pear strudel spiced with garam masala. Wanderer Pear Strudel aka Wanderer Birnenstrudel. The original intention of this recipe was to be a pastry. It ended up being healthy enough for Rob and I to split for a sweet, delicious and filling lunch. Traditional Viennese Apple Strudel is not a traditional German winter holiday recipe. Yet Wanderer Pear Strudel will still be a welcome addition to any holiday meal for it is cozy and comforting. Which is exactly what you hunger for this chilly time of the year. The name Wanderer Pear Strudel comes from the fact that while strudels are German desserts, this strudel travels all over the world. The garam masala mix that gives my dessert its unique flavor originates in India. Pears come from mild coastal climates found in western Europe, north Africa and eastern Asia. If you are wondering whether you should make this recipe the answer is a wholehearted ‘yes’. I usually stick to simple recipes but this recipe is worth all of the effort. Prepare this recipe and I dare you to try to not love it. I adored it. Wanderer Pear Strudel is a more impressive (and not to mention healthier) version of a traditional dessert pie. The pictures above don’t do the strudel justice. Would you fancy a guilt-free dessert recipe for the holiday season? I have one for you. You may feel the need to eat a carrot after a piece of this strudel, but there is no need for that. 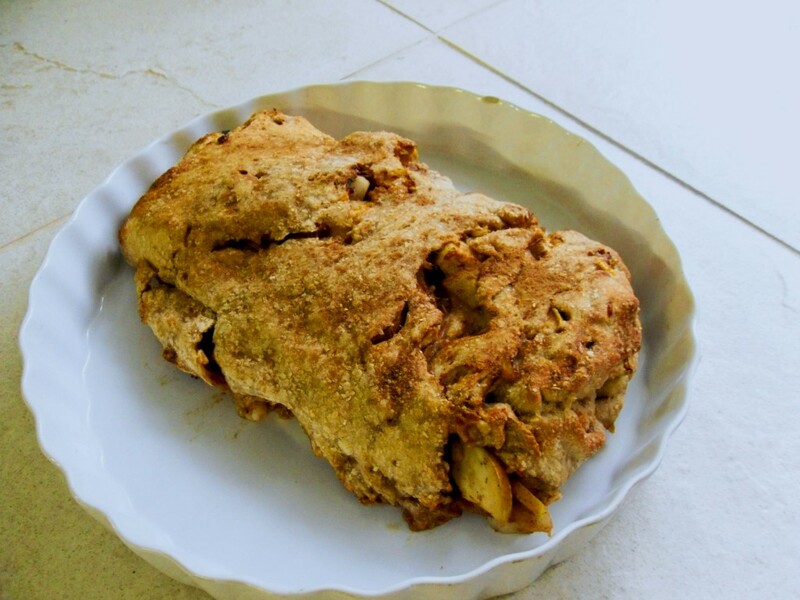 Wanderer Pear Strudel is a nutritious, filling and flavorful addition to your holiday season. There is no guilty pleasure in this delicious dessert, just pleasure. Prepare it today and enjoy it warm or cold for a treat that is sure to lift your spirits. Start the dough by mixing together all ingredients. Knead the dough for 5 minutes. It should be smooth and slightly tacky. It shouldn’t stick to the counter. Add as little flour as necessary in order to knead. Wrap dough in plastic wrap and allow to rest in a warm place while you prepare the filling. You may even prepare the dough a few hours ahead. For the first part of the filling, quarter and core the pears. Cut the pears into narrow slices. Mix together the pears, lemon juice, zest, spices and Splenda in a bowl. Set aside. For the second part of the filling add the dates, date-soaking water and rice to a small mixing bowl. Mash the dates into the rice with a fork. . Set aside. Prepare a large, clean kitchen cloth with flour. This is where you will stretch the dough. On a floured surface other than the towel, roll your dough into a shape of your floured cloth. It should be lesser in size but similar in dimensions to your floured cloth. Aim to roll the dough 1/2-1/4 of an inch thick (1-2 cm). Transfer the dough to the floured cloth. Starting from the middle and working outward, stretch the dough thinner and thinner, ensuring you don’t tear it. Stretch it as thin as possible but make sure you don’t tear it. Tears make the strudel increasingly difficult to transfer to the baking pan. Next spread the rice/date mixture onto the dough, leaving a few inches around the edge of the dough without filling. Evenly distribute the pears on top of the dough as you did with the previous filling. Fold three out of the four edges of the dough over the filling to seal the sides. Start rolling the dough on top of itself towards the fourth unfolded edge. Transfer the strudel to a nonstick baking pan utilizing the cloth. Tip: To help do the transfer, I placed the strudel and cloth on a large firm surface (e.g. a cutting board), set the baking pan on top, then quickly flipped over the cutting board-strudel-pan “sandwich” so the pan was on the bottom and the cutting board was on top. Sprinkle with cinnamon if desired. Bake the strudel for 25-35 minutes. If your strudel is thin and long expect a cooking time close to 25 minutes. If your strudel is short and thick expect a cooking time close to 35 minutes. After removing from the oven, slice and enjoy warm or cold.